Buy Prunus Armeniaca Early Moorpark apricot fruit tree for sale online from UK specialist suppliers of garden fruit trees. An earlier form of this famous variety which was supposedly introduced from the continent to Moorpark, Herts. in the mid 18th Century. Early Moorpark (Prunus armeniaca 'Early Moorpark') has an attractive pale yellow skin with an orange blush on the sunny side. The apricots have deep reddish-orange flesh and are very juicy. A good choice of apricot for planting on walls or a sheltered spot to protect from spring frost. 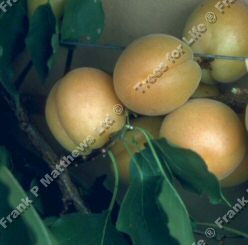 Fertility: This apricot is self -fertile so no need for another apricot to act as a pollination partner for it to produce fruit however the yield "may" or "should" be improved by having one. Can you tell we won't commit to that one? Generally speaking throughout the fruit tree world self-fertile trees do improve their yield when pollination partners are close by and we cannot find anything to suggest the Early Moorpark should be any different. Not a very demanding tree but a few things to remember. Make sure you plant the Apricot tree in a well drained spot where there is a lot of sun. Prune the tree to allow sun in and air to circulate into the centre. As Apricots are early flowering fruit trees, they may be exposed to spring frosts. A fleece over the tree or planting close to a wall should help. If you have a large Apricot crop, prune in Mid May as part of the fruit thinning procedure. If a small crop, prune after harvest. Never prune in October through to end of April. If pot growing Apricots consistent watering is essential. A dry spell followed by watering can split the fruit. As with other stone fruit trees such as Plum, Damsons and Gages, Apricot fruit trees are a bit spoilt when it comes to being left in a container over Winter (Oct-March) They may decide out of spite to not do so well next year or as the ultimate act of defiance, just stop living. If you must have your Apricot fruit tree in a container, we advise leaving in a greenhouse or conservatory over the Winter months. Bush: Has branches starting lower down the main trunk.